Marcelo published a post on his blog about JTAG and the library he wrote. The library is hosted on Github. More details at Marcelo’s EE & CS blog. 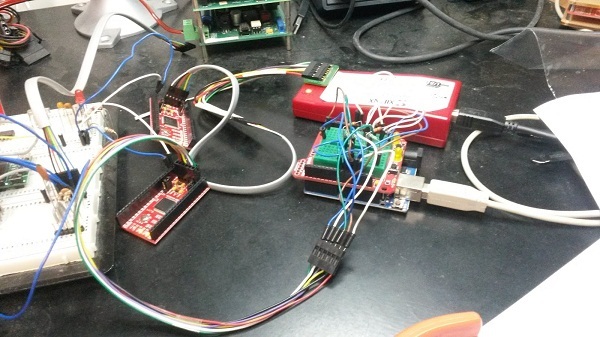 This entry was posted on Wednesday, August 19th, 2015 at 12:45 pm	and is filed under Arduino, JTAG. You can follow any responses to this entry through the RSS 2.0 feed. You can skip to the end and leave a response. Pinging is currently not allowed. Cool – Let’s try this with one of the Dangerous Prototypes CPLD breakout boards. I don’t know JTAG but I guess it is something processor and supplier independent interface? I think Teensy 3.1 comes preloaded with a bootloader that is ATMEL STK500 protocol compliant (because it works with the Arduino IDE, for-example). So I suggest you configure your Eclipse IDE to communicate with the Teensy using the STK500 protocol, which I am pretty sure it should be able to do. Heck working from memory, I don’t even think the JTAG pins are brought out on the Teensy 3.1 – are they?